I was beautifully surprised (but not really surprised, because I knew there was a reason I would create such a crazy camp as Rainbow Unicorn - dude I live in the vortex of syncronicity) when the real rainbow showed up. Double Rainbow in fact. I guess I shouldn't be disappointed that no one else notices my complete fluid alignment with the universe. But sometimes, I wish someone would notice - and give me a freaking award for it. Because yeah, I do it for myself, but I also do it to show that it can be done. On second thought. Maybe that double rainbow was my award. Maybe being me is reward in itself. 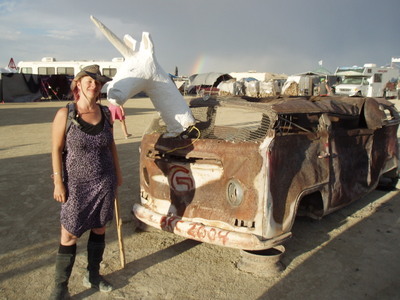 My sister let me know that you had been on the playa...wish I had known before! This year I was at 9:30 and Jungle (thought I would try the suburbs, I don't recommend it). Looks like we're in the same business as well, but you were able to escape the midwest. Actually my wife and I have been scoping SF for a while now and I'm willing to be we'll be there by next summer. See you on the playa next year? Apparently I'll be wearing red white and blue..